The below artworks are the most important by Grace Hartigan - that both overview the major creative periods, and highlight the greatest achievements by the artist. Artwork description & Analysis: In this early painting, completed after she returned from Mexico, Hartigan works in a typical all-over Abstract Expressionist style with influences from Surrealism. The work showcases her quick, vibrant brushwork along with her interest in chance as shown by the dripping paint and the fact that she did not complete any preliminary drawings for this painting. The dominance of curved, biomorphic forms seems a foreshadowing of her later interest in figuration, while the addition in the lower left of a cutout from a Life magazine advertisement for pancakes underscores her interest in everyday life. Artwork description & Analysis: This work shows Hartigan coming into her own as an artist, combining both painterly brushwork and her burgeoning interest in figurative art. This painting was the first in a series, based on 12 prose poems by Hartigan's friend Frank O'Hara, entitled "Oranges: 12 Pastorals." 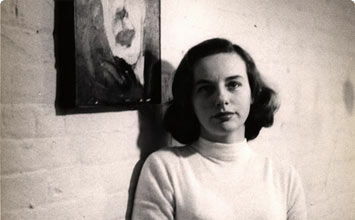 O'Hara often wrote about his spontaneous creative process and it may have been this that intrigued Hartigan - how to translate the immediacy of his creativity into her own work. Hartigan had declared in her journal in October 1951 that for her "the 'all-over' picture is finished. It had become a formula." Hartigan's use of the word "formula" suggests that she was bored with abstraction and wanted to experiment with more traditional compositional structure. Her related experiments with figuration that began the next year are evident here. She includes the entirety of the poem on the canvas in a graffiti-like interplay of image and text that challenges the traditional relation between surface and representation. The figure with blonde hair placed horizontally along the bottom of the canvas seems to correspond with the Ophelia of O'Hara's poem but without traditional gender markers. 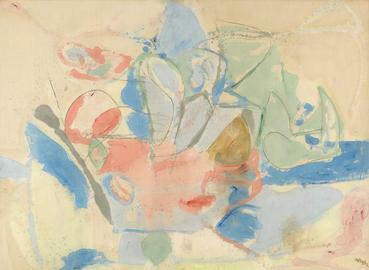 Her inclusion of a figure that registers as human only because of the reference to "Ophelia" painted on the canvas likely points to her indebtedness to Willem de Kooning. Artwork description & Analysis: This is one of Hartigan's best-known pieces that again underscores her willingness to abandon total abstraction in favor of adding recognizable elements into her composition in order to incorporate the everyday world that enthralled her. Her experiments in this vein set her apart from other Abstract Expressionists with the exception of Willem de Kooning and made her work a bridge between the Abstract Expressionists, neo-Dada, and Pop artists. Here she is also showing the influence of her study of the Old Masters, which she began in 1952. Artwork description & Analysis: Summer Street implies urban action and movement through choppy brushwork, without directly representing it. This is a classic example of Hartigan's treatment of abstraction, which is not void of representation but rather includes a recognizable fruit stand amid a swirl of pattern and color along with a sketchy rendering of her friend, Elaine de Kooning, in the foreground wearing blue sunglasses. De Kooning's legs blend with the wheels of the bicycle on which she sits. The playful canvas seems to pay homage to the joys and diversions of the summer months as they are experienced on a busy urban street. Hartigan's paintings, regardless of period, treat the canvas surface with extreme urgency, in that they are painted quickly and without much "regression" in space, as she called it. Artwork description & Analysis: The subject of this painting, Marilyn Monroe, suggest affinities to Pop art because of the popularity of Monroe with Pop artists, especially Andy Warhol. Hartigan's treatment differs, however, in part because it does not have a slick, emotionless feel, but rather showcases a variety of brushwork that marks the presence of the artist. Warm colors dominate the canvas, particularly red, which is associated with the body, blood, and sexuality. The brushwork is softer than in the works discussed above, but Hartigan also includes scratches, stippling, and heavy, dark lines. She worked from several photographs to create a sort of abstract painted collage whose disjointed quality was for Hartigan closer to the "real" Marilyn, than it was to the glossy facade she presented to the public that was the focus for Warhol and other Pop artists. Monroe's mouth, taken from a famous Life photograph, dominates the upper part of the canvas, while the extended hand across the bottom was influenced by a detail from Andrea Mantegna's fresco Arrival of Cardinal Francesco Gonzaga (1474), again showing the artist's interest in art history. Artwork description & Analysis: This work was part of series entitled Great Queens and Empresses that Hartigan began in the fall of 1983. 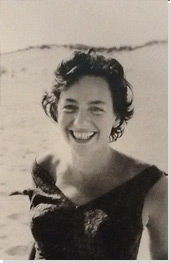 Her interest in strong women, including Theodora and Elizabeth I, was likely influenced by Hartigan's own attempts to combat her alcoholism during this period. In the painting of Joséphine, Hartigan focused on the yellow, Empire-waist gown of the Empress that highlights her sophisticated elegance - something that she worked hard to attain. Joséphine was born on the island of Martinique and married at the age of 15. The newlywed couple moved to Paris where Joséphine's manners were provincial and embarrassing to her husband whom she eventually divorced. Years later, as Empress of France, Joséphine helped make fashionable what became known as the Empire silhouette. Hartigan's painting is a reminder of the discipline needed for such a transformation at a time when French women had little political power.